10 May 2011; Fourth Day at Sea. During the night we had thunder and lightning to the North of us, where the centre of this small weather system was passing by. We only noticed the rain and a little bit more swell than the day before. However by 09.00 hrs it had all past by and it turned into a nice sunny day. The temperatures are also starting to creep up. During the first day of the crossing the noon time temperature was around 66oF (19oC) it has now risen to about 70oF (or 20oC. Maybe not much of a rise in the absolute but with the wind chill factor disappearing it is becoming more and more pleasant on the decks even if it is a bit breezy. The latter has given the Front Office quite a headache. When it gets windy around the ship, the bridge phones the Front Office and asks them to put up signs on the doors that lead to the open decks. We have two sorts of them, signs I mean. Those to warn; to stay inside due to very strong winds; and those to open the doors carefully because of windy conditions. With the wind patterns continuously changing around the ship, the signs go up; the signs have to be changed and in between the signs go off and then might come back again. Still safety comes first, so the Front Office Ladies keep trotting around the ship with new signs. We are now nearing the North American Continent and that means that ocean is getting less deep. We are still looking at 5,000 to 10,000 feet but gradually it is getting less. This area is called the Bermuda Rise and on top of it are the Bermudian Islands. We will pass Bermuda around 02.00 tonight at a distance of about 220 miles to the North of us. This is the same area we will pass again, but then we will be to the North of it during our next cruise, when we go back to Europe. That cruise has already my full attention as the planning always runs quite a bit ahead of what is current. My Navigator is already two cruises ahead with his preliminary planning and I am now going through his end result for next cruise. That sounds more dramatic than it is. It is basically reviewing if the course lines drawn are the best ones and if previous experience gives reason for a few changes. As an example, when the ship goes to Martha’s vineyard after New York, there is the option to arrive early and drop the anchor and wait until arrival time, or adjust speed and arrange for a just in time arrival. You look at fuel consumption; sometimes going fast for a few hours saves more fuel than the whole night going slow. You look at the average weather, the chance of fog during the time of the year and also what works better for the Pilotage as it is a long way in. Similar thoughts also go for other ports. If there is another cruise ship expected, then it is also interesting for the planning to see if we should arrive first if possible, or if you cannot beat the other, arrive later. Those reflections on a coming cruise are pertinent to a captain’s work and the more often you have been somewhere, the easier it is. I carry with me a photo database with pictures of every port I have ever been to. That really helps to refresh the memory when looking at the planned arrival sequence. Nowadays it helps to search on Google Earth as well, as you can then see straight away if they have rebuilt the whole place during the period that you did not visit. With the cruise industry getting more and more popular, that is not an unusual occurrence. In the lower left you can see in the blue the Bahamian islands on the chart. 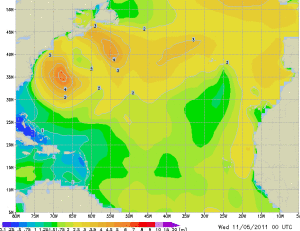 The ship is located to the East and we will just be skirting the orange stuff (4 meter waves) tomorrow when it has spread a bit further to the south. For this cruise, there is only the weather still to look at. My ETA for Fort Lauderdale has been received and the Harbourmaster confirms the ETA of 06.00 at the pilot station. The only thing we still have to do is to get there. And that is going to be a bit of a wobbly ride. A small weather system off Cape Hatteras is intensifying and coming South East. That means very windy weather in Bermuda, but also further south where we are. So tonight the wind will increase and with it the waves and by mid morning tomorrow we should have 14 to 15 feet of swell running, partly on the beam. That is better than on the bow, otherwise we really will start pitching. Now we will move about a bit, but the stabilizers will dampen most of the roll. So for tonight I will keep the pedal to the metal and then slow down by 8 am in the morning, to ensure an more comfortable ride and by that time, I should be enough “in the plus” with the speed to be able to maintain the schedule while doing so. 11 May 2011; Fifth day at Sea. I am a little puzzled: the information in ‘Notes for the Reader and my sailing schedule’ indicates that you will leave for your break on May 13, but apparently you are planning for next week –when Capt. Gunderson was scheduled to be on. Are we blog readers lucky to see more sailing blog entries next week, or is it merely SOP to plan ahead (just in case you must stay on longer than scheduled) and leave a preliminary plan for your relief? No, I will be leaving on 13 May, but the ship will sail on, and so I have to plan for it accordinlgy.